If you are interested in growing bamboo, there are a few points to consider to ensure that you grow this interesting plant successfully. Bamboo is a very versatile plant. It is fast growing and makes a good sustainable source of material for many uses. Bamboo can be used for things as diverse as creating kitchen counter tops, making fine yarns and fabrics or used as a green building material. Bamboo is a popular plant to grow. It is often used in green landscaping projects and can be used as a living screen. When planning on growing bamboo in your garden it is important to research and pick the right type of bamboo. While bamboo is often thought of as a tropical plant, some varieties will grow in colder temperatures. 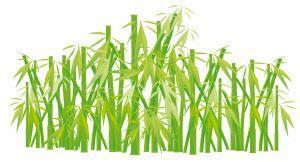 Local garden centers will stock varieties of bamboo plant that are best suited to your climate conditions. If local garden centers cannot help then specialist mail order companies can provide plants that are suitable for specific conditions. Bamboo is a form of grass and has a reputation for quickly growing out of control and taking over a garden. Some forms of bamboo are more invasive than others. Clumping varieties are less likely to spread and these can be a good alternative to invasive varieties. Invasive varieties can be grown in pots. This will help to stop the plant from spreading. If the pot should break or crack, however, the bamboo may break through and continue spreading around the garden. A pot will contain the bamboo and make it easier to control. People enjoy growing bamboo for different reasons. It is important to pick the right type of bamboo that is best suited for the purpose that it is grown. Decorative bamboos, for instance, are grown because of attractive features and may be a slower growing bamboo than other varieties. If bamboo is needed for a screen then it may be important to pick a fast and tall growing variety. Bamboo needs careful watering. It requires regular watering but does not grow well where there is standing water. Good drainage is helpful for optimum growth. Bamboo is grown for its foliage. As such, a regular feeding with a high nitrogen fertilizer will help to give good results. Bamboo Garden - another specialist website that offers a lot of information. Varieties are listed by hardiness type. Tropical Bamboo - offers ornamental and decorative clumping varieties of bamboo. Support and advice is provided on the website and a nursery is open to visitors six days a week. Bamboo can be a good plant to grow in the garden and with such a wide variety of plants available, growing bamboo can be successful in all but the coldest of climates.